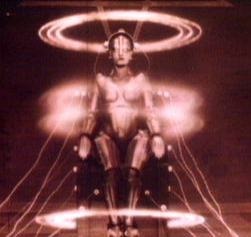 The latest restoration of Fritz Lang’s silent sci-fi epic Metropolis won’t play the Bay Area until the The San Francisco Silent Film Festival in July. But I’m currently in New York, and I saw it Friday night at the Film Forum. I’m finally willing to call it a true masterpiece. I can no longer say that “the beautiful imagery only makes the melodramatic plot and characters seem all the more trite.” What have we been missing all these years? Better character development. It’s no longer trite melodrama. In case you haven’t heard, a very bad, 16mm print of something like Lang’s original cut was found about two years ago. For details, see this New York Times article. Wonderful as this new restoration is, it’s hardly the ideal Metropolis. Several shots and one key scene are still missing, with the scene only described in intertitles. And the newly-added scenes look horrible—very badly scratched and not filling the entire frame. Part of the image was lost when it was transferred to 16mm in the 1970’s. While that image quality is extremely detrimental if you just want to enjoy the movie, it’s an advantage academically. There’s no guesswork as to whether you’re watching a new scene. If it looks horrible, you are. And what do these horrible-looking scenes add? We learn far more about the relationship between the city ruler, Joh Fredersen, and the mad scientist Rotwang. They’re tied together by a history that makes them hate each other even when they need each other. There’s also a subplot involving a worker who impersonates a member of the aristocracy, getting to enjoy a life of glamour and comfort while trailed by a very evil-looking detective. With a considerable number of added shots, the last act still makes a thrilling series of action set pieces, although the last of those set pieces still feels like one-to-many thrills. But it’s now the topping on a much better film. What was once a visually spectacular political melodrama is now an epic story of real people in a futuristic setting. The Film Forum’s presentation wasn’t ideal. They projected it in HD rather than on film, and with a recorded rather than live score. The HD looked excellent—I can’t really say for sure that it lost anything that way. The score was also very good…for a recorded score. That’s never the optimum way to see a silent film. I’m looking forward to its festival screening at the Castro in July. That one should get it right. Update, 5/21: The screening in July at the Castro will also be digital. But the Alloy Orchestra will be live.